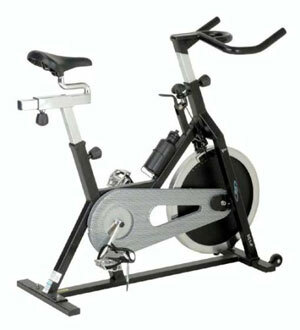 With its sturdy, durable design, you can cycle on the V-Fit SC1-P Aerobic Training Cycle on a daily basis. 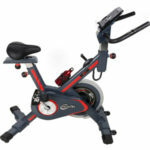 The exercise bike comes equipped with a racing style seat and foam padded grips on its handlebars. The toe straps on the bike can also be adjusted to offer extra stability when pedaling. With a smooth-running flywheel made of cast iron and rim enhanced with chrome, you will find that cycling inside will become a regular activity. The V-Fit SC1-P aerobic training cycle is an excellent way to increase your level of aerobic fitness with less chance for injury. Using this model bike will cause you to burn fat and calories more efficiently, and stay toned and fit. Using a cycle is a good way to improve how you look and feel and aids in lowering the impact that can result in injury to the lower back, hip, and knees. To improve your circulation and increase your aerobic capacity, the safest forms of exercise to pursue are cycling and swimming. Cycling is often preferred over swimming however as not everyone has easy access to a pool. In addition, cycling inside on a stationary bike or training cycle, such as the V-Fit SC1-P aerobic training cycle, is better than biking outside as it is less jarring and therefore reduces the chance, again, that you will suffer from hurt joints or lower back pain. Plus, cycling on the V-Fit exercise bike is more convenient too. You can make use of the training cycle whenever you want, even while watching TV. Many consumers commented that they had to start using a training cycle when they suffered an injury from an exercise such as running or working out on a treadmill. 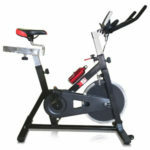 The V-Fit exercise bike is also recommended for people who have not exercised too often before or who are overweight. One consumer stated that he started using the cycle after an old neck injury started giving him problems. And, another consumer mentioned that he bought the exercise bike when he was unable to work out after getting hurt while running. 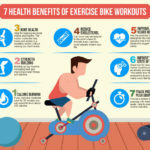 This kind of exercise bike is used most often and, again, is suitable for anyone who is suffering from the effects of high-impact aerobic exercise. Therefore, if you have any type of ailment, such as back pain, neck pain, or similar aches and discomfort, you will like using this machine for the purpose of exercise or to lose weight. Plus, there is the safety feature that also promotes use of a cycle. For example, treadmill users can trip and fall when using that particular type of exercise equipment and people who choose to work out on an elliptical machine are also susceptible to injury if they lose their bearing. Therefore, a cycle like the V-Fit SC1-P aerobic training cycle enables the user to get fit while lowering the chance that he may hurt his knees, joints, or back or become injured on the exercise machine. A great many consumers who used the V-Fit SC1-P Aerobic Training Cycle loved it and thought that it was well worth the money. One customer who purchased the exercise machine said that he was quite astounded at how the cycle closely compared with bikes he had previously used during gym workouts. His only complaint was that he found the seat to be rather uncomfortable. However, he did add that he knew, in most cases, bikes of this type usually did not come with extra comfortable, padded seating. Another consumer said he found that the exercise bike provided a smooth ride and that he would highly recommend the cycle while yet another consumer said he’d give the cycle a 5-star rating for its solid construction. 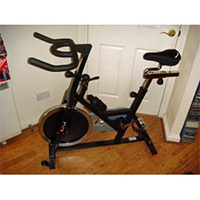 He said he found the cycle to be a definite bargain next to other exercise machines. That said, one reviewer did not have such a positive response to using the V-Fit exercise bike. She said the bike annoyingly rattled and that she did not feel it was due to any failings on her part with respect to assembly. She added that she returned the cycle after using it for a couple weeks which was, by no means, a simple undertaking given that she had thrown the packaging away. Some of the reviewers who provided positive comments though said that they did not understand the poor rating given by this consumer as they had, as already mentioned, quite the opposite results. For obtaining a low-impact quality aerobic workout, all in all, the V-Fit exercise bike earns the high marks from consumers who have bought and regularly use the product. 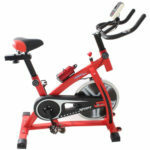 Check out more customer reviews about this V-fit SC1-P Aerobic Training Cycle at Amazon here.